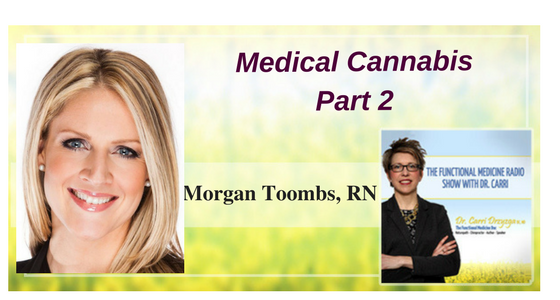 In this episode of The Functional Medicine Radio Show, Dr. Carri’s special guest Morgan Toombs, Registered Nurse shares even more information on medical cannabis. Morgan is the Nurse Manager of Canada’s first Nurse Practitioner led Medical Marijuana Clinic “O Cannabis Clinic”. She is a multi-published author, Humanitarian Award winner for exceptional nursing care, as well as an award winning Adult Educator. Morgan is passionate about helping Canadians navigate the confusing medical marijuana landscape and believes that Canadians should have affordable and timely access to medical marijuana – even if they live in the Yukon! What happens when your licensed producer runs out of your prescription or specific strain of medical cannabis? Can you be fired for using medical cannabis? What are some side effects of medical cannabis? What do you mean by micro-dosing? Do patients need to be referred to your clinic? In the situation of a producer running out of a specific strain, the patient may have to wait up to three months to be able to purchase medicine again. Alternatively, they can be transferred to another producer that has the strain they are looking for but it can still take a long time. It’s a major bottleneck in the industry right now. Using cannabis for medical purposes is not something you can be fired for but you need to have a conversation with your boss before you use it at work. There are also plenty of cannabis products that don’t have psychoactive effects that won’t affect your work performance. There is a lot of work to be done in the professions that use drug tests. Having a frank conversation with your employer is a good first step. One of the side effects of medical cannabis is joy and increased well being. There hasn’t has been a single lethal dose of marijuana ever so it’s been proven to be extremely safe compared to traditional medicines. Practitioners encourage patients to take it low and slow when starting out with medical cannabis. Micro-dosing is usually done with a vaporizer. The effects typically last for a few hours and occur very quickly after being exposed. Edibles are better for experienced users since you can’t be certain how much of a dose you are getting, which is why they aren’t sold legally in Canada. There are a lot of pathways to getting medical cannabis, you have to do your research into the different producers and make sure you using the right process to register your prescription. Best practices include realizing that just because something is covered by OHIP, that doesn’t mean there aren’t other fees. Even if you have been self medicating with cannabis for years, there is still a lot of information you need to know before you can use it medically. Patients do not need to be referred to the O Cannabis Clinic, but they do need to be screened to make sure they have a valid medical reason to come work with them.